Roberto Sánchez, popularly known as Sandro , died on January 4th in Mendoza, Argentina. He was one of the pioneers of Argentinean rock music in the early 1960s, and became famous all over Latin America as a romantic music artist. Until recently, his shows in Argentina attracted multitudes, but he retired from the scene because of health issues. His smoking habit created limitations in his respiratory capacity with the passing of the years. He also had a heart problem. His condition got to a point where he needed a heart and lung transplant, which was performed in November 2009. Forty-five days later, Sandro died at the age of 64. Photo by Globovisión and used under a Creative Commons license. According to Ruth Vilar of the blog Escribiendo en Voz Alta [es]  they say “Sandro only leaves us physically, because we know great people never die. And he belonged to that group”. The blog Extremista [es]  writes that “during the funeral, more than 50 thousand people showed up to give a last goodbye to Roberto Sánchez at the Argentinean Congress, and the cars that followed him to the cemetery carried nearly 100 wreaths”. The topic of his death made the cover of many magazines and newspapers, as Irina of the blog Lado B [es] says. TV cameras were not allowed in the funeral, as requested by Sandro's family. 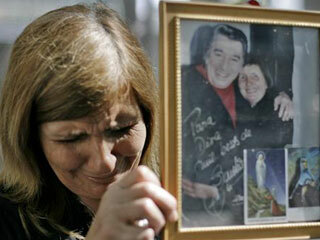 However, the C5N channel broadcasted a video that did not respect the family's wish, as the blog 2papiros [es]  notes.